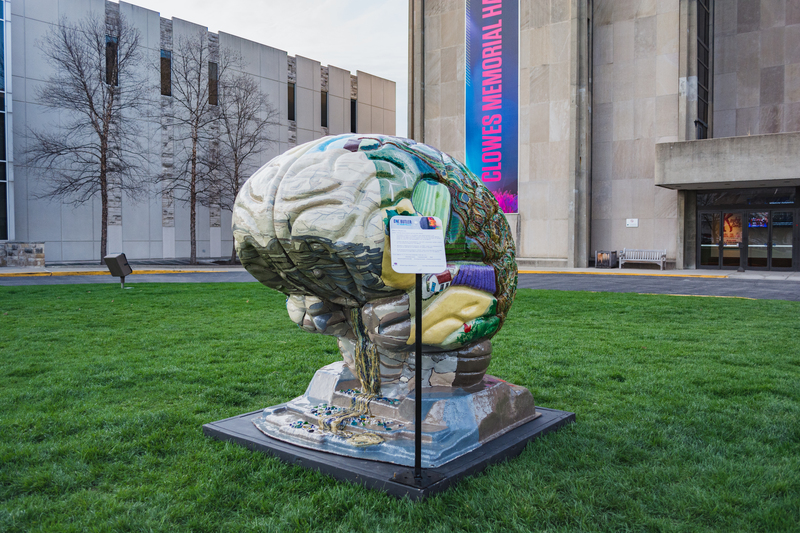 On the afternoon of March 29, 12 brain statues and a neuroanatomist stood in front of Clowes Memorial Hall. The statues were a part of One Butler: The Brain Project. The neuroanatomist was Dr. Jill Bolte Taylor. The brains were commissioned by Taylor and now sit at various locations around campus. Taylor is a neuroanatomist who studied at Harvard and researched schizophrenia and mental illness. In 1996, Dr. Taylor suffered a brain hemorrhage which left her unable to walk, talk, read, write or remember much of her previous life. Taylor said that learning how to read again was the most challenging aspect of her recovery. A map of where the brain sculptures can be found on campus from Butler’s website. It took her eight years to fully recover. In 2008, she delivered a TED Talk about the experience. With more than 20 million views, it is one of the top five most viewed TED Talks of all time. “What [my stroke] did was it gave me insight into the brain from a completely different perspective and gave me a better perspective of what is going on within the left brain and the right brain,” Taylor said. Post-TED Talk, she was chosen as one of TIME Magazine’s 100 Most Influential People in the World in 2008. She was interviewed by Oprah and Dr. Oz on the Oprah Winfrey show later that year. Her book, “My Stroke of Insight: a Brain Scientist’s Personal Journey,” spent 17 weeks on the New York Times Best Seller List. Taylor also founded her own not-for-profit that helps people to find their way back from neurological trauma. Butler faculty, administrators, trustees and students have been planning for The Brain Project since last spring. The planning group, made up of representatives from across Butler’s colleges, had been following the work of Taylor for years prior and had a connection to her through Community Hospital. Taylor made an appearance at last year’s graduation as the commencement speaker. Taylor along with other members of the College of Education faculty formed a group to brainstorm ideas for the events. From there, Butler faculty came up with the speaker series, and Taylor agreed to be the first speaker. Taylor kicked off this year’s events on Sept. 14 as with her talk, “The Human Brain: How It Works and How We Can Get It to Work for You” in Clowes Hall. Taylor said she believes that events like The Brain Project are important for educating people about themselves. Catherine Pangan, associate professor and program chair of the Brain Project, was one of the organizers who helped assemble the speaker lineup for The Brain Project. One of the impressive aspects of the project is that all of the speakers are local. To Pangan, The Brain Project is important because the information being presented will help people take care of themselves. “We want people to know what good brain care looks like from a basic neuroanatomy perspective in hopes that that translates for a healthier, happier life for themselves and their communities for generations to come,” Pangan said. College of Education dean Ena Shelley and the rest of the organizers designed The Brain Project so that it would incorporate all of the respective colleges, as well as the Indianapolis community. She said she is impressed with the way that Butler students have taken interest in The Brain Project. “It related to me because through art therapy, as a teacher, I can have a better understanding of what someone is feeling and thinking, especially students who come from rough backgrounds,” Shelley said. Shelley believes that events like The Brain Project are important for college campuses because of the ways that they can dispel rumors about mental health. There is one more event for The Brain Project. Brian Hainline, the senior vice president and chief medical advisor for the NCAA, will be speaking on “The Neuropsychiatric Benefit of Sport and Exercise” on April 11 in the Reilly Room.